Porsche restored by Singer and Williams – with 500bhp! When Porsche owner Scott Blattner asked renowned restorers Singer what was possible in the restoration and modification of his 964, the result was a comprehensive study and collaboration with Williams Advanced Engineering. The result is perhaps more extensive than Scott might have imagined, leading to a new selection of restoration and modification services, known as DLS [Dynamics and Lightweighting Study], collaboratively developed by Singer, Williams Advanced Engineering and a collection of specialists such as Michelin, Brembo, and BBS Motorsport. Porsche legends Norbert Singer and Hans Mezger also joined in as consultants, bringing years of knowledge in aerodynamics and engine development. 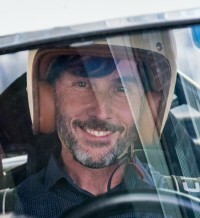 Racing driver Marino Franchitti together with journalist Chris Harris have also been drafted in as development drivers, working in collaboration with Williams Advanced Engineering’s vehicle development team. * Porsche four-valve, four-camshaft, naturally aspirated, 500bhp air-cooled flat-six engine developed by Williams Advanced Engineering with consultation by Hans Mezger. Underbody and surface aero performance optimised through CFD analysis, by Williams Advanced Engineering, with consultation by Norbert Singer. Improved suspension philosophy including weight reduction, enhanced geometry and improved adjustability. Further weight reduction methods and use of magnesium, titanium, carbon fibre and other advanced materials contributing to a minimum vehicle weight of 990kg. And if that's not enough, how about this: bespoke Michelin Pilot Sport Cup 2 tyres; lightweight 18in forged magnesium BBS Motorsport monobloc, centre-lock wheels; lightweight, monobloc Brembo brake calipers and carbon composite discs; Magnesium, lightweight 6-speed Hewland transmission; and bespoke EXE-TC dampers. The Dynamics and Lightweighting Study has been presented to Singer’s current client base and the first commissions that have already been taken will start soon, though prices have not been disclosed – they vary according to specification of course – but bear in mind that even a non-DLS 911 restored and modified by Singer tends to cost around $650,000. The restoration and modification of these cars – just 75 of them – will take place in the UK at a dedicated Singer facility housed on the Williams campus at Grove in Oxfordshire, already named as 'Singer at Grove'.